As most of you will know, the Inglorious12th thunderclap went out on 12th August, and it spread it's message far and wide. "I want to see an end to raptor persecution in the uplands. Criminal activity needs to be stopped #Inglorious12th"
By the time the message went out at 9:30am last Saturday, 3565 people had signed up to the thunderclap and we had created an outstanding social reach of 11,093,561. When I first set up the thunderclap, I was hoping to beat the numbers of previous ones I had done, but never in my wildest dreams did I expect such amazing numbers. I just wanted to say a massive thank you to everyone who has supported the thunderclap. Every single sign up has helped spread the message further and helped it to trend on twitter. People from all different backgrounds signed up, so we really did reach out to a lot of people who may not have even heard of a hen harrier before. I wish I could do individual thanks to everyone, I have tried to on twitter. Your support has meant everything and is the reason that the thunderclap was such a success. I must say a special thank you to a few people (and I am really sorry if I miss anyone out). Mark Avery - Mark, thank you so much for your constant support throughout the thunderclap. Your blogging, tweeting, talks etc have made a massive difference, and all the emails, DMs and encouragement are very much appreciated. I have some more ideas for another campaign, but it can wait until I get back from Portugal! 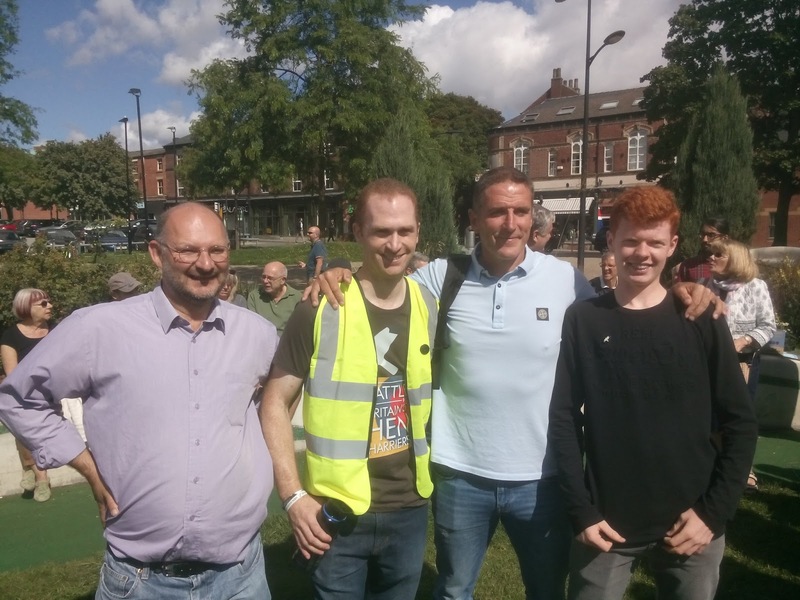 Chris Packham, Rob Sheldon, Blanaid Denman, Jeff Knot, Nick Miles, Natalie Bennett, @JW4926, @NannyBirds, @SheffEnvironmental - thank you for using your power to spread the message further. There are also some groups and organisations that must be mentioned; RSPB, Wildlife Trust, BAWC, Raptor Persecution, Team4Nature, League Against Cruel Sports, Rare Bird Alert. Thank you for the constant pushing of the thunderclap and for signing of course. Again, sorry if I have missed anyone, I am grateful to each and every person that helped make a difference. I know as soon as I post this that I will think of a load more names I should have mentioned. So what happens next? Well for me, I will let the impact of the thunderclap settle and hope that it has given some people food for thought. But awareness raising can be done in so many different ways and must be steady and constant to keep the message reaching out to more people. Earlier this year I collected a whole list of words from people. I asked then to tell me the first word that came into their head when they think about hen harriers. I have kept that list of words safe, and it will form part of my next awareness campaign and I will be asking for you help. But more on that when I get home. 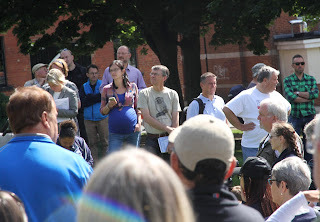 2014 was the year that the first ever Hen Harrier Day event was organised. Many of you readers will recognise the name "the sodden 570". 570 people turning up at a Hen Harrier Day event in the Peak District (quite frankly in the middle of nowhere) accompanied by the tail end of a hurricane is really rather impressive. Since that first inspiring Hen Harrier Day, every year more and more Hen Harrier Day events have been popping up across the UK and this year has been no different. This year I attended the Sheffield Hen Harrier Day event. Arriving in a good time, after a reflective journey across miles of moorland, we had chance for a spot of breakfast before heading over to the main event organised by Sheffield Environmental (@SheffEnvironment). Before the talks took place, it was nice to have a good hour catching up with friends and fellow conservationists, some of which had travelled many miles to be there, which really emphasises the support these events have gained over the past few years and how much outrage people feel towards the illegal persecution of upland wildlife; including the hen harrier. Each and every speaker perfectly explained their feelings towards the illegal persecution of the hen harrier (and other upland species). Their talks put into words the feelings of everyone listening; that the illegal persecution of the hen harrier and other upland raptor species must be stopped. All agreed that steps must be taken to safeguard native upland species from the continued, short sighted persecution. Liz Ballard (CEO at Sheffield and Rotherham Wildlife Trust), Dr Ross Cameron (Senior Lecturer Landscape Management & Design at the University of Sheffield), David Wood (Chair of Sheffield Bird Study Group), Dr Mark Avery (author, conservationist and so much more), Blánaid Denman (RSPB Hen Harrier Life+ project manager), Natalie Bennett (former Green Party leader) and Iolo Williams all delivered heartfelt and fact filled talks. It was great to listen to Blanaid Denman talking about her fantastic work with the RSPB Skydancer project team, but it was sad knowing that this was her last talk in that role. 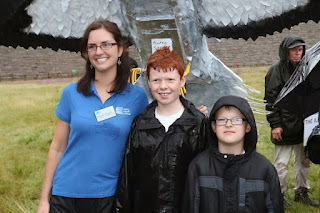 I first met Blanaid at the 2014 hen harrier day, and we have both seen so many changes since then. I'm sure many of you will share the same thoughts that I do regarding the amazing part she has played in hen harrier conservation and awareness raising over the last 6 years. I wish her all the best for her new job role and the new addition to her family. 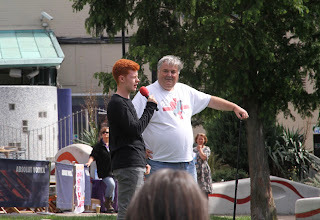 Mark Avery gave yet another absolutely fantastic speech and also gave me the chance to promote my thunderclap to some of the folk who may not be aware of what a thunderclap is or how to sign up. It was however encouraging to see the majority of the audience raising their hands to the question of "who has signed this thunderclap". The final speaker of today's event was Iolo Williams. His speech really did delve deep into our hearts. 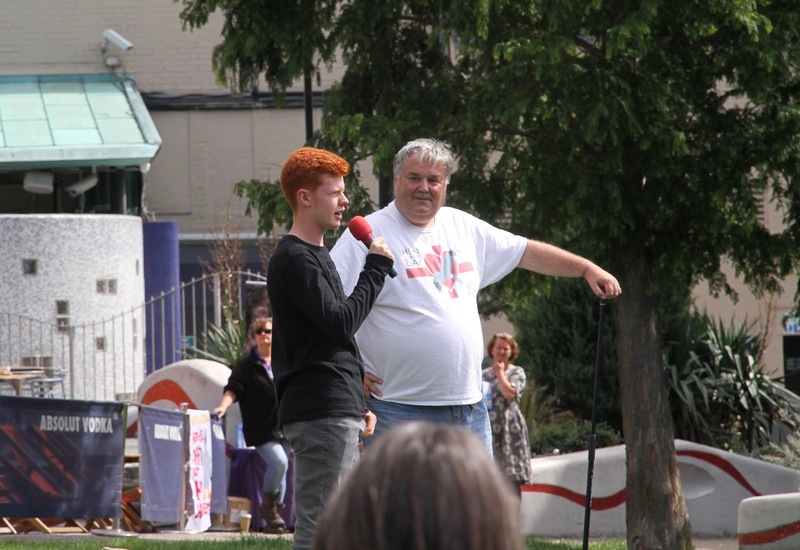 He started by discussing some of his personal experiences with the iconic hen harrier and ended with a really powerful, dramatic, anger filled rant based on why anyone would want to deliberately harm such a special species. His speech honestly did echo everyones thoughts and feelings. I'll end my summary with a quote from Iolo's talk stating "we will win", words that I have heard again and again in the fight against raptor persecution. After witnessing all the emotion crammed into today's event (and I am sure this was mirrored at events across the country), I have hope that we will indeed win. Our voices are getting stronger and stronger by the day as more people are becoming aware of the devastation taking place in the uplands. If you have not already done so, please sign the #Inglorious12th Thunderclap scheduled to go out on 12th August to keep the awareness going. 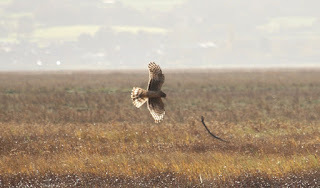 The RSPB Skydancer team today announced the number of breeding hen harrier pairs in England this year. Last year there were just 4 breeding pairs, and Finn was the offspring of one of them. I did not expect the numbers to be great this year, but I had hoped to see a small increase. However, only 3 pairs of hen harrier have successfully bred in England this year. The habitat is there for them, the food is there for them. Other ground nesting birds do well in the uplands. The uplands are lacking natural balance; the legal and illegal persecution of red grouse predators goes on. Although technically a wild bird, the intensive rearing of red grouse in the uplands devastates the other native species. Please don't just sit and think how awful it is and do nothing. Please speak out against the on going persecution taking place in the uplands. Please make sure that future generations get to witness the spectacle of a sky dance. The cycle of death in the uplands has gone on too long. Hen harriers, peregrines, buzzards, foxes, mountain hairs are just a handful of the species killed and culled (legally and illegally) to boost unnatural numbers of red grouse that will then be shot. How can anyone fail to have a problem with that. So please join the 1675 people that have already signed the #Inglorious12th thunderclap which will go out across social media on 12th August and raise mass awareness about the persecution that continues in the uplands, our uplands. Your natural inheritance is being stolen from you so please CLICK HERE and help spread the word that what is happening is wrong.